While the tradition of equestrian performances to music is centuries old, the idea of a competition dressage freestyle, or Kur, to music is relatively new. The first FEI freestyle competition was held at the 1985 Volvo World Cup, and freestyles were part of Olympic competition for the first time in 1996, at Atlanta. Now a part of Olympic, World and Young Riders’ championships, the freestyle is quickly becoming an important part of dressage competition at all levels. In North America freestyles are offered at most recognized competitions, and the number of entries increases every year. No one needs to remind us – though spouses seem never to tire of doing so – dressage can be agonizingly dull to watch, especially for the non-rider. A good freestyle on the other hand is entertaining and even inspiring, not just for other riders, but for everyone. 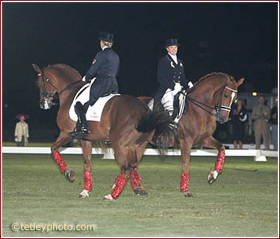 Dressage straddles the worlds of sport and art, and nowhere are both more in evidence than in the freestyle. As audiences swell for the freestyle classes at shows, it becomes easier to interest sponsors. Sponsors contribute prizes, money and brand name recognition that make the competitions in turn more attractive to competitors. More competitors, more spectators, more sponsors: success for the sport. EVERYONE! Children on ponies, adult amateurs, world champions. 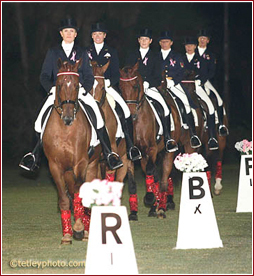 If you compete in dressage at any level, you can ride a freestyle. And you should. Freestyles are fun to create, and even more fun to perform. Do the horses enjoy them? Of course! Whether it is spooking at the speakers, or doing a big trot to a loud part in the music, the horse gets a chance to be a little more himself. We know that horses can’t dance, but they can play. Freestyles offer the opportunity to let the individual in the horse be expressed. It is no coincidence that a horse’s best performance is often in the freestyle. So what are you waiting for? Turn up the music!